Home » Stash Invest Review – Is It Even Worth It? Stash Invest Review – Is It Even Worth It? It’s no secret that investing jargon can sound like a foreign language. This can deter many people from ever taking the time to learn what they actually need to know. On top of that, many brokerages require investors to have minimum balances and automatic deposits that are just too much. Fortunately, those days are long gone. Technology has been huge for lowering investment barriers. There are now so many options that are both accessible and easy to understand by everyone. One of those options that could be a good fit for you is the Stash Invest App. If you want to skip the review, we honestly don't recommend Stash because of the high fees. Instead, we recommend that investors check out a full-service free solution like TD Ameritrade or Fidelity. Both of these companies offer great apps, no minimum IRAs, and hundreds of commission-free ETFs. Skip to the end of the article to understand why. If you're looking to Stash because you want to buy fractional shares and don't have a lot of money, check out Stockpile or M1 Finance. Stockpile allows you to buy fractional shares and it makes it really easy to invest. They target investing towards kids and families - that's how easy it is! Plus, you get $5 in free stock for signing up. M1 Finance is a little more in-depth but allows you to build a portfolio of stocks and ETFs for free - yes free. No fees. This is a great solution for the investor who wants a little more than just buying a stock or mutual fund. If you want an app-based option, check out these 5 apps that allow you to actually invest for free. Stash Invest is an app that launched in 2015 after the founders set out to answer the question: why don’t half of Americans invest? They kept coming back to one answer. Most people found investing to be un-relatable, expensive and intimidating. (Can you relate?!) From those answers, Stash Invest was born. 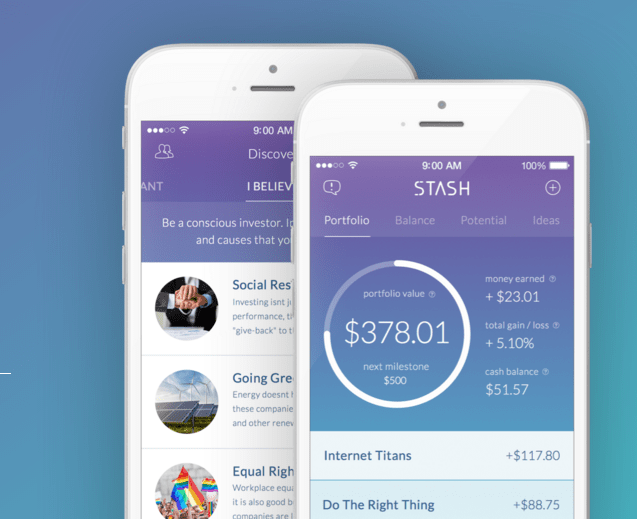 The Stash Invest app allows investors to start investing with as little as $5. Not only that, but Stash makes choosing investments extremely simple. Stash Invest offers 30 different themed investments to choose from which are narrowed down by your risk tolerance and personal preference. Through the app, you can buy additional investments, diversify, and monitor your progress. They also have low fees at only $1 per month if your account has less than $5,000 or 0.25% per year if your account holds more than $5,000. Plus, Stash Invest is free for the first three months, which gives you time to build up your Stash. Click here to check out Stash Invest online and get started on your desktop. Click here to get Stash for free on the App Store, you’ll be directed to the app store and you can download the app to your phone. Next, you’ll fill out your basic information and answer a couple of questions. These questions will help Stash guide you on making investment decisions. It’s important that you’re honest with these survey questions because they help determine your risk tolerance. This should only take a couple of minutes. The great thing about Stash is that they make investing relatable. Instead of crazy names of ETFs and ticker symbols, you invest in “themes” that are based on your wants, beliefs, or likes. Link up the bank account you want to have money withdrawn from to make your investments. It takes about 2-3 days for the money to transfer into Stash. Verify your identity, create a four digit pin number and you’re all done. Stash does things differently than your traditional investing app or brokerage. Instead of choosing a stock or ticker symbol to invest in, you choose from themed investments. This is a really great way to make investing relatable, while at the same making investing affordable and easy. For example, if you believe that Americans will spend more on healthcare simply because they are getting older, you could invest in “Live Long & Prosper”. This investment is based on an ETF that invests in U.S. healthcare companies. Similarly, you could invest in your “wants”. For example, you could want to invest in a piece of Warren Buffett. The “Roll With Buffett” investment features Warren Buffett’s company, Berkshire Hathaway. When you click on an investment you can see the underlying holdings – real companies that you invest in. Placing an investment is really easy. You just click on the “Add To Portfolio” button and enter how much you want to invest. The goal of Stash (and any investment account) is to build your portfolio over time. 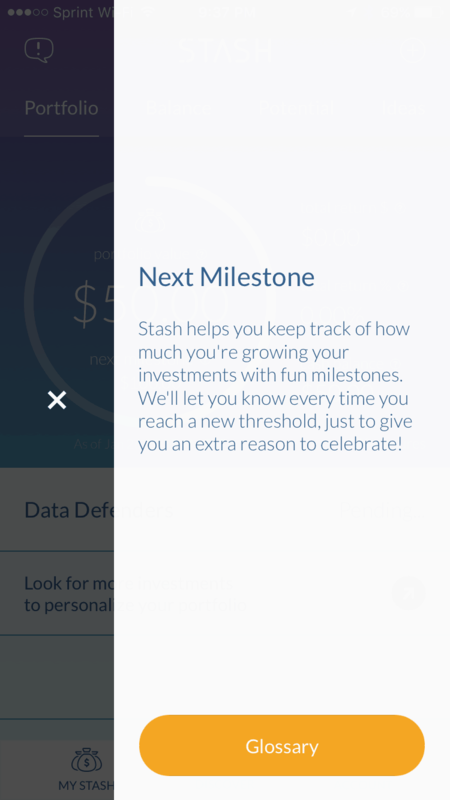 Stash Invest makes it fun and easy by creating milestones and ways to encourage you to invest more. Stash also tries to show you your potential – by both adding new investments and teaching you the value of investing often. Over time, you can check in your home screen and see how your portfolio is doing overall. You can also enable Diversify Me. Stash has a feature called Stash Retire, which is a retirement account option for investors. Stash Retire offers both Traditional and Roth IRAs - and offers the same investment choices you'd find in Stash. You can contribute up to the IRA Contribution Limit in a Stash Retire account. Stash Retire is slightly more expensive than Stash Invest - it costs $2 per month in fees up to $5,000, then it's 0.25% of the value of your account. You can still start investing with just $5, but that could be quickly eroded by fees if you don't invest more and see investment gains. On June 20, 2018, Stash announced that it would waive the fees for any Stash members under age 25. This is a great incentive to get people to start investing early without the fees. We appreciate the change, and hope it encourages younger Americans to start investing. This is very similar to what Acorns currently offers. However, once you cross age 25, you should probably look for alternative investment providers to avoid the fees. Stash also recently launched a banking feature on its app. They offer a waitlist to join their banking program, which offers no minimum checking, zero monthly fees, and access to some ATMs fee free. Of course, the banking aspect connects seamlessly to Stash Invest, to allow you to manage all your money in one place. The biggest drawback of Stash is the cost. $1 per month (or 0.25%) may not seem like a lot, but on a small portfolio, the percentage is very high. $1 per month is $12 per year. On a $100 investment that is 12% in investing fees. That's incredibly hard to earn back, and those fees keep coming. That can really kill your portfolio's earning potential. Let’s look at an example to break it down. If you’re interested in Technology Stocks, you might consider investing in Stash’s Internet Titan’s ETF. This ETF is actually ticker symbol FDN, which is First Trust Dow Jones Internet Index Fund. This ETF has an expense ratio of 0.54% – which is pretty high for a domestic ETF. If you want to invest in a similar ETF at Fidelity, you’d probably go with FTEC, which is Fidelity MSCI Information Technology Index ETF. It invests in the same companies, and it has an expense ratio of just 0.08%. It’s also commission-free to invest in. The Stash ETF alone is 6.75x more expensive to own than the fund at Fidelity. Plus, you have that $1/mo fee on top of it! In percentage terms, your investment would end up costing about 1.74% per year in fees. At Fidelity, it’s just the 0.08%. So, when you add in the monthly fees, it ends up being 21.75x more expensive to invest at Stash than Fidelity!! All those extra fees are doing is hurting your return over time. You might say, well, I can't invest in fractional shares at Fidelity or another broker - and you are correct. But that small feature isn't worth paying over 21x more. What I'd honestly recommend is opening an IRA or brokerage account at a mainstream brokerage like TD Ameritrade or Fidelity. What most people don't realize is that you can open an IRA with no minimum, you can get access to hundreds of commission free ETFs, and you have a great app to use. 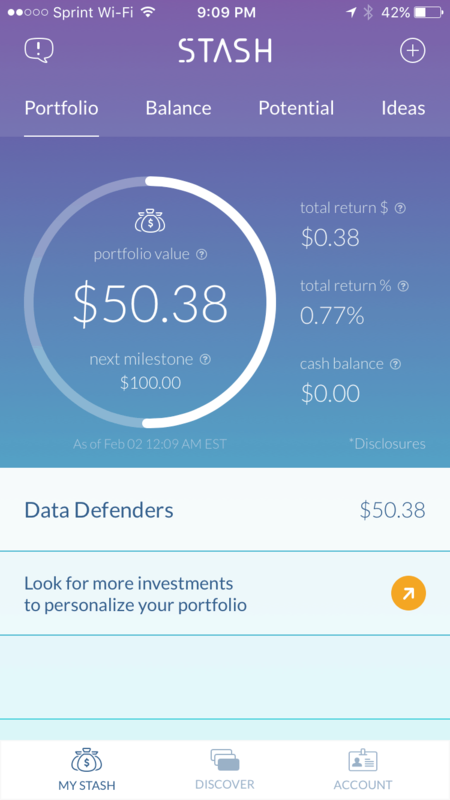 You essentially can build your entire diversified portfolio for free, on an app. So, instead of paying high fees and investing in their custom ETFs, you simply get a regular "mainstream" account, can invest in the same ETFs, and experience no fees. Check out TD Ameritrade for yourself. If you're looking for something that allows you to buy small amounts, check out Stockpile or M1 Finance. The bottom line is that there are a lot cheaper, and better services out there. 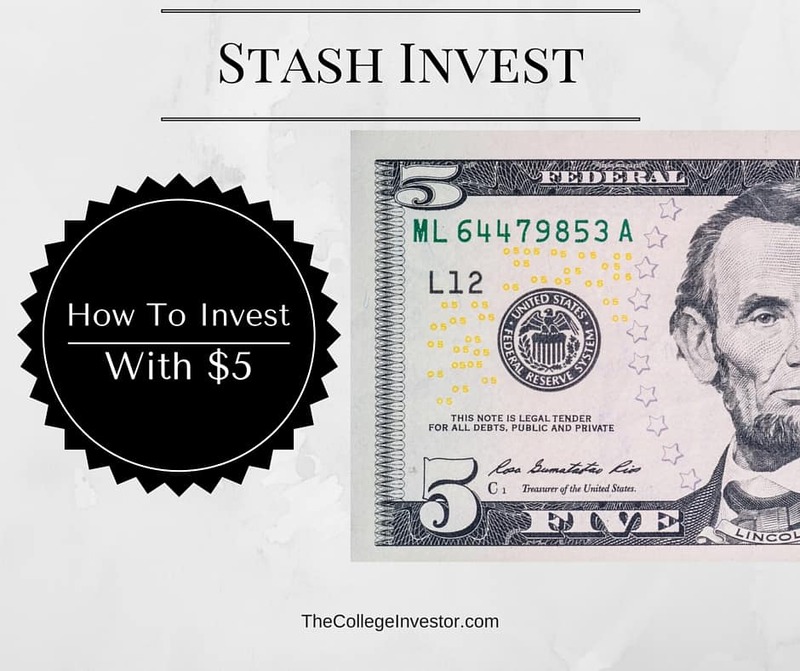 With Stash, all you need is $5 to make a deposit. This is perfect for anyone getting started. Plus, it’s so easy to understand! A bunch of $5 investments can add up to something big. If you want to get started investing but haven’t made the plunge, consider Stash, but also consider other options. For every investing style, there is likely a better and cheaper solution. Stash Invest is a new app that allows investors to start investing with $5, while picking stocks in themed based investments around wants. I don’t care for an app you cannot investigate before inputting my bank account? Plus, it’s pushy. Open the app and it flat refuses to close. I am not really fond/want to connect my bank account info to what is supposed to be “My STASH ACCOUNT” -I don’t understand why I have to directly connect my personal banking accounts to an app that can withdraw fees from my account it seems to be a VERY HIGH SECURITY RISK to put your banking information on an app that you are simply trying to “STASH”/SAVE “Money On until you have enough to try to make investments that will flip your $50.00 into a $100.00 or just Make more money on what you choose to invest in.I think STASH would be a great idea if it was an account all by it’s self that you can use to make investments. I agree. I would even prefer paying through a Paypal account or something similar. But directly connecting my bank account…makes me too nervous. Me too! Thanks for sharing. Is there such an option available? I was very impressed with the app. I started filling in the blanks until I got to the bank user ID and password… Ummm… Not just yet. yeah, the app wants you to share your bank information before allowing you to read its policies. I sent am email requesting copy of its policies and got no reply. Terre – I’ve not had any problems with the app. Sorry to hear that yours didn’t work well. I think one of the greatest benefits of an app and investment option like this is that it may help change the way that consumers think about saving money (the phone interface that makes account info readily accessible, very low minimum investment options, and real time updates). For me, it has helped me consider savings options on par with other real time purchase/spending options. For instance, do I get something to eat on the way home, or do I eat when I get home? Stash allows me to take the $10 that I saved by not eating out and put it immediately in my Stash account. So, savings/investing becomes a real time option, instead of a more distant/future alternative. Interesting, how much have you made since then? I’m curious. …If you don’t want to share, that’s fine. I just can’t help but wonder as to the rate of return and the risks (if any) you were told there might be. I started using Stash in March, 2017. I put $25 in. I did watch it grow … pennies, obviously… but it showed me 3 things quickly: 1. I’d never invested before because I thought I didn’t have the money to invest. Heck, I didn’t even save. But because you can buy partial shares in diversified ETFs, throwing $$s into investments became easy. 2) you need to commit to putting money regularly into it, even if it’s a little, because you need to earn enough to cover the $1/mo. fee. However, that’s easier over time because you’ll find that 3) saving money and WATCHING IT GROW over time is actually FUN! I never saved anything. Lived paycheck to paycheck. But after starting with Stash, I’ve found the way to make ends meet and still save money to invest. I started with $25, quickly got the “itch” and in 8 months I’ve invested $850 of money I never would have saved (about $100/mo… they will automatically invest any $ amount you’d like in any manner of investment you like on a regular basis. I have $50 taken out every 2 weeks and spread it out over 4 ETFs. The auto stash feature is nice and easy. It comes out of my bank account on payday and I never even miss it), … and after 8 months have $61 in earnings to show for it, and growing my savings (and future investment returns) at the same time. Advisors say the $1 fee is excessive, but I find the ability to buy partial shares and spread the risk is easier with stash, and heck, I can’t get a 10% return on any savings account… can you? Overall, I’d say for the small guy with a commitment to investing $50-$100 a month, it’s a Godsend. By the time fees are figured, you’re actually so far at just under 6% averaged yearly yield. As you pointed out though, who gets that from a bank account? Answer, nobidy. So even at ~6%, STASHing still has value. Keep up the new habit, and I wish you great gains! I agree with this 100%. It is fun and fulfilling to watch your money grow over time. I do not make a lot of money either but it does add up! Stash is great for the small and beginning investor. It also works for the individual who has a hard time saving. Stash makes it fun and since they only offer ETFs – fairly safe in the investment world. I agree with the author about the fee structure. The thing is people are putting in $5 that they would have spent on something they probably did not need. I like the Ameritrade for investors who have enough $ to buy one share. Then again I may use Robinhood who doesn’t charge any commissions. Even the ETF prices are getting up there in price per share. There has been no problems with the checking account except for people who set up an auto deposit and forget about the debit which causes overdraft fees. I don’t set auto deposit because I’m one of those that may forget. Stash lets the little guy invest in the market. I’m also up 9.8% since March 2017 and the program has encourage me to save $1300. I find stash to be very easy. It got me to invest and ive wanted to for years. In this time. I feel I am lucky to have found it. Imo its a great time to bet on American companies. Unless your Nordstrom. I’ve been a user of the Android app since March of 2015. Set up is simple. There are access points on almost every page that enables users to transfer money into an account to create or add to an investment. However withdrawing or selling all or part of my investment (not dividends or available cash) is hidden. The cognitive workload that it takes to find a call to action that will enable me to withdraw or sell my investment is a deal breaker. If an app or any service for that matter is great at acquiring customers then they should be equally transparent when it comes to cancellation of service. I concur, Carlos, as I have yet to find the “secret trap door” that allows me to withdraw my cash at my disposal. It is easy, click on your investment and click on the orange buy/sell button in the top middle. Follow the prompts. Not sure why you don’t see that. Hope that helps. Exactly. Ive had no issue. I so agree with being able to acces and close your account with Stash. I can only find an email to contact them, and to date I have tried three emails to them without a word back. I stopped all debits from my account a while ago and now they attempted to debit my account 1.00 and I did not have funds in this account they want me to pay them 30.00 to have access to an account I asked to be closed a long time ago. This is now sounds like a scam. How come they will not respond to my emails asking them to close my account??????? Did you start your account in the US and now can’t access it? I having the same problem trying to find out how to withdraw my money. Robert, any thoughts on that? A little late, but did you guys have success withdrawing your money? Every time I try and withdraw money (selling the stocks) I get half of it to my available money to use and half to my available money to withdraw which is really irritating because I want all of my sold stocks to be able to be withdrawn not just half!! Yes, but I had to email customer service. It’s an investment app. Not a trading app/checking account. I’m new to it and and it’s pretty clear in their pitch, that this isn’t meant for aggressive trading and withdrawals. There are hundreds of apps for aggressive stock action. Emailing or calling this company to get your money shouldn’t annoy you when this is clearly an app for beginners who would like to “invest” for at least a while and/or learn how to save for the future. It might help to read before you toss your money into something. No matter what type of app, no company should make it difficult to close or withdraw your funds. What if you simply want to move to a truly free brokerage? Most online brokerages and apps don’t make it difficult to withdraw funds. Man I don’t know if you have some kind of personal vendetta against Stash. But I’ve been using this app for nine months and I’m up 14% on my investments. No personal vendetta, they are just really expensive to invest in. I always say that Stash makes it super easy to invest, and it make it understandable. However, you are paying 21x what you would pay at a discount broker – for what? Up 14%? If you spend 20-30 minutes learning the basics, you can easily do the same thing at a discount broker like Vanguard, Fidelity, TD Ameritrade, etc. You are underperforming the stock market right now – the S&P 500 is up 20.25% YTD through December 1, 2017. Even if you had a 75% stock and 25% bond portfolio of low cost ETFs, you’d be up 15% – so you’re underperforming, likely taking on more risk because you’re not diversified, AND paying more for the privilege… help me understand? Get back to us once you’ve tried to close your account. What are the fees and associated cost on withdrawal? If in case I want to close the account, what are the termination terms? Would like to know the full picture not just bells and whistles, thanks. Not that hard guys. Click on investment you made. Click orange buy/sell button. Click sell. Type in amount you want to sell….follow prompts. Hope that helps all. The little as $5 is quite misleading. You’d have to have returns of 240% to actually make money. But they don’t increase the fee rate until you get to $5,000. So the more money we add (up to $5,000) the less we lose in fees. At $100, we still need returns of 12%. That’s pretty unlikely, but not impossible. $250 – 4.8% This is probably about all we can expect to make on our investments. We might make a bit more, but we could do less too. $5,000 – At $5,000 the fee model changes to a flat 0.25%, which is only slightly worse than what we were getting before. The catch here, of course, is that we aren’t guaranteed a 3% or 7% return. We aren’t even guaranteed a positive return. You could lose 10% and still get dinged with the monthly fees. Contrary to how they are marketing it, this isn’t an app for someone to try out investing with a few bucks to see what happens. If you want to hope to make enough to overcome the fees then you’re going to need to risk at least $250 or $500. Any less and you’re not really investing at all, you’re just paying their fees. They deduct the fees from your bank, not your stash in the app. So it may look like you’re making money as your stash goes up, but really you’re just dinging your bank account with their monthly fees. If you can do more than $500, then you have a shot at actually making some money here. But to the article’s point, if you have a couple thousand dollars laying around, there are other places that you could attempt to invest it for less fees. The $5 they spot you to start, and the free month they give you, does give you 6 months to invest without fees and see what happens though. But don’t stick around any longer than that unless you’re willing to risk some real money on this project. You’re spot on. The title of the article is “Investing With $5 Isn’t Worth It” and we say so in the first paragraph. We recommend opening a no-minimum IRA at Fidelity or TD Ameritrade, and leveraging their commission free ETFs. Now you have an almost truly free investing experience. If you do choose to invest $600 monthly, you’d quickly jump into the 0.25% annual fee amount. In year one, you’d pay: $8 + $18 = $26 in fees to Stash. That ends up equaling 0.36% in expenses, which might not see like a lot, but it is an additional fee on top of what you’re paying the ETFs inside Stash. That’s why we recommend going with something truly free. Even a robo-adivsor like Wealthfront that charges 0.25% in fees gives you the first $10,000 free so that you can escape the high fee/low amount timing of your portfolio. And for their fee, they actually do the investing for you. With Wealthfront, is there a penalty when withdrawing? Second, Fidelity currently offers a promo of 200 free trades for 2 years. That means you could build a portfolio of non-free ETFs and still not pay anything. Finally, the S&P 500 has returned roughly 9% over the 8 months. You have underperformed the market by 3%. I’ve been using Stash for a year, and I love it. I’ve also had no trouble selling off my ETFs. I like it because IRAs usually have penalties for drawing money before retirement age; whereas, if I needed to… I can draw from Stash. They’re also coming out with something called Stash Retire, which will be a Roth IRA. I’m going to do that too. Never can you have too many baskets. I’m so confused by this because you say you don’t like IRAs because they have penalties for withdrawing the money early, but then you promote their new product Stash Retire, and say you’re going to do that too. This sounds phishy to me. If you’re looking to do an IRA, open an account at a place that doesn’t charge you fees! I’m not opposed to an IRA, and I’ve been looking into them. But generally, I prefer most of my investments to be less rigid long-term options. I’ve looked into Ameritrade tonight, signed up, and made my first transfer. I’m not sure what I think about it yet, so the jury’s still out. The appeal of Stash is that it’s made easy. I’ve always found investing to be daunting, which is where other trading platforms have always lost me. Now that I’ve stashed for a year, I’m feeling more confident and learning as I go along. There’s nothing “phishy” about that. I have really appreciated reading the above article! Although I do not disagree that the misleading alignment for “new investors” is to start off with $5 (huge % of fees with this balance), I think it is a extremely practical approach for people that have a few thousand dollars sitting in the bank account. Personally, I TRADE with Robinhood with no fees and have done well by using technical analysis off third party sources and this has been great! However my biggest draw to use STASH as well was that I wanted a place to put a couple thousand dollars in a less risky – moderate investment fund where it has the capability of increasing in value apart from the extremely lousy 0.001% interest in typical major banking accounts. I was tired of seeing “Interest Credit – $0.07” in my account instead of something I could at least buy a hamburger with. A friend of mine uses Stash. I did not really know much about it until reading reviews today. I told him to sign up with Robinhood instead because the $1 monthly fee is still $12 he would have to generate annually with his Stash account to just break even. I missed telling him that the ETFs he has also have expense rates, so the $12 is on top of the fund expenses. I imagine he does not have much money in Stash currently. I do not even know how Stash buys the ETFs. Can you buy fractional shares? That is the drawback with Robinhood. You have to buy whole shares. He is a generation younger than me too. I kind of want to give him advice I wish I had when I was his age. He is on the right path I guess but since he is a millennial, I think he does not have much money to invest or does not understand that he could FIRE in 20 years if he wanted to. The problem I had with Robinhood when I was JUST starting to invest was having to buy full shares. There’s no way to diversify your risk when you’re investing in yourself by $100/mo. You can buy Stash ETFs in fractions. I started small, realized I was going to get KILLED in fees if I didn’t commit, started investing $50 every 2 weeks out of each paycheck, and in 8 months now have $850 saved with an additional $61 in earnings (drawing about a 12% return right now). From a guy who never saved a dime in years. Pretty proud of that. Baby steps… If I get to where I can buy full ETF shares, then TD or FIDELITY would be viable. But right now, for ease of use, and with the $ amount I’m investing every month, Stash works for me just fine. I just downloaded the app a couple months ago for the fun of it. I only throw a small amount of money ($25/wk) into the account, but I like to trade aggressively with it just for thrills. This is roughly the same amount of spending I otherwise would spend on a hobby or game, and even at a loss I will still have something left of my money when I get bored with it and cash out. So far, 6 weeks in, I’ve averaged just under 1% per week, which has earned me $4 to offset the $1 charge coming up. Honestly, this article is totally correct to say that Stash isn’t worth the money as a true investment app. However, as a training tool or a fun way to feel like a rich kid, go nuts. My only complaint with this app really is that they consistently miss the two trading windows that they use, and it can be very frustrating watching a stock price free fall after you’ve already put in the sell order an hour previously. If they’re going to impose trading windows, that’s fine, but they should at least hold to using the trading windows they say. Today, my purchase didn’t go through until 45 minutes after the trading window closed, and that’s a long time in stock land. If all you can set aside is $5, you’ve got no business in even thinking about investing…Another fintech company exploiting the ignorance of consumers. Think about how they market themselves..”invest in things you care about…” Their entire appeal (to those uninformed) is based upon the #1 fundamntal rule which is to NEVER make decisions based on emotions…that should tell you all you need to know about Stash. Sure it’s easy…for them to get your money from your account into theirs. Nothing against Stash, calling it like I see it. I just signed up for an account with Stash today. I am looking long-term, and more than $5 a week. Assuming that my choices were of the more “positive” trend than “negative,” I actually see me earning more than a regular savings account, which I have minimally also. I like the the idea of playing around with the various ETFs, but I won’t discontinue my 401K, or mutual funds. I really wish that something like this had been around when my son was younger, if nothing else than to show him what his money could do for him. I do not think he has a clue as to what is available to him besides savings. I don’t have a perfect past with finances, so far be it to take my advice, just wish he would learn about investing, he works too hard not to. Way up top of this fascinating string, someone mentioned their anxiety about entering their bank account into an app they haven’t even broken in yet. I was surprised more people didn’t raise the same flag. I started creating my Stash profile tonight and it asked for my phone #–ok, I’m a little squeamish about that, but I gave it–then my SS#–yes I KNOW they need it, but it’s like being asked for a *u** before we’ve had our first dance. And then they want my bank account? I wanted to slap them in the face and tell them I’m not that kind of investor. But when I googled “is Stash safe?” there were no gongs clanging or nails screeching on blackboards about identity theft or worse, so I guess inputting this ultra-private formation is okay. Right? It just seems out of step with the paranoia of the times. HOWEVER: why can’t I use my Paypal account as my funding source? (As that first up-top genius also asked.) My bank account is joint with my husband; my Paypal is my own. If Stash wants this intense intimacy and I’m not ready, wouldn’t Paypal or another kind of account be a good way to get acquainted? I thought this was supposed to be about investing MY WAY, with choices. It shouldn’t matter to Stash where the investment money comes from, so…conclusion: I’m gonna shop around some more. Do click the “5 more investment apps” link up above, btw. Good info. I’m like that previous commenter who got a bit nervous when they asked for s o much personal information but surprisingly I gave them my social and right NOW it’s at the enter your bank info on my other phone, while I googled is this app safe, which lead me here and I think I’m going to stop and NOT give my bank info and get out while I can! Thanks for all of the advice..
Stash app is great and it is not expensive as you suggest. It’s definitely expensive comparing to competing financial tools. At every level – from the beginner Stasher with just $5, to the advanced investor, there are better, lower cost options across the board. But if you are just starting out and not the “advanced” investor then why not try Stash? It is really not expensive. And who really invest only 5.00 a month? Sadly a lot of people only invest a little bit and get eaten up by fees. According to their latest regulatory filing, Stash has 1,002,613 accounts, with a total asset value of $318,988,278. That means their average account has $318 in it! At that level, the average investor is paying Stash alone 3.77% in fees to invest at $1/mo (not including the underlying fund expenses). That’s extremely expensive to other options on the marketplace – and for every scenario I can think of, there is probably a better choice. You don’t have to be advanced to use any other platform. What are you looking to do? Does anyone know if Stash computes the taxable basis when one sells? I’m afraid of the hours it would take to compute the taxable basis from all of these tiny purchases. Yes, it will be on the 1099 they send you at tax time. Since 2006 the IRS has required that investment companies keep track. Now I’m kind of confused after reading this and the comments. So it it a good app to invest in or no? We don’t recommend it. There are better alternatives for pretty much every situation you want to invest for. I am new to investing but using this app is making me money. ( I assume) Not sure if this is how buying and selling works but I deposit $60 a month over 4 different ETFs. Every day I check my portfolio. If my stock is up even just a dollar, I sell the profit. I have been doing this for almost a month now. I have $179 invested but also have an additional $90 in available funds. That’s not a recommended approach – you should buy and hold. Not only are you realizing a lot of gains (short term, so high tax), you’re not going to enjoy the benefits of long term growth. I did the math and investing for $5.00 is pretty silly to expect a return. It’s more of a headline as a minimum investment amount, which is fine. I started off using stash when I was doing delivery of auto parts while putting myself through school. I made minimum wage and it was nice being able to toss 20-30 bucks a paycheck into an account that was really transparent and didn’t make me feel like a schmuck for having such low investment #’s. I’ve tried acorns and Robinhood and felt like Acorns did not have the flexibility or the choices I wanted and Robinhood is a bit advanced for where I’m at. After about 16 months of using stash, I have about $4,000 in it with $500 gains. Wow! Honestly, that’s not too bad as I’m diversified but have most of my stocks in American Tech and some in Asian companies to help balance the portfolio. Dividends are cool and this app definitely has helped me get my feet off the ground as an investor. I feel like this article was way underdone. It was like you wrote a review of the restaurant by trying out the mints in the waiting room. You didn’t really experience it all. But that’s my personal opinion. Honestly, I feel like you need to stick to whatever investment you want and stick it out to be able to see good returns. If you’re trying to make money in less than a year, you’re gonna have a bad time. I want to start investing and this app sounds good but the thought of putting my bank account details is putting me off completely. If there was an option to use PayPal and then they take fees from my investment and not from my account I would so sign up for this. But I will not risk my banking info and besides, I hate money leaving my account automatically. I’d rather be the one to decide what leaves and what goes in. I don’t mean disrespect but if you “hate money leaving my account automatically” it’s because you don’t have a clue how to take care of and track your money. I would get financial assistance and maybe take a financial class. Hmmm! I have been using stash, I think Farrington’s math is inaccurate, with the internet titans example, he has taken a corner case, .58% + $12 and making it 21% expense. Stash allows you to buy fractional stocks, it is not clear what fees are involved there, but nowhere else can you accumulate AMZN, GOOGL or BRK.B fractionally without Fees, additionally dollar cost averaging should help you, and for college students after 10 years, they may have some stocks of AMZN, obviously all companies do not continue to infinity and you have to sell them at some point, but AMZN for now seem as sure as the ground we stand on, but I have TDAmeritrade and they charge $6.99 or more per trade, to even buy 1 ETF of internet Titans you would shell out $6.99+.58%. Regardless, the most disconcerting part of Farrington’s analysis is the lack of clarity on ease of withdrawl from Stash, does anyone have real experience on that? Hey Prakash, have you checked out M1 Finance? You can invest in fractional shares of all those stocks for free? I can repeat the math at other companies like M1, and it still works out better than Stash. Stash is good for automatic investing and making it easy to understand things, but you pay a premium for that. For all those squeamish about providing their bank account info, I’m not sure there is an investment trading platform that doesn’t require that information. I’ve tried out several, and have always had to provide a bank account for the money to be drafted from to fund the investment, and in this case, drafting for the monthly fee. They are not going to let you go through Paypal because 1) that costs them additional fees that they would have to recoup from you somehow, and 2) I’m guessing there are additional securities regulations requiring *Cash* from investors rather than a funding vehicle like Paypal where investors could be getting charged on a credit card. I love Stash — even though I have most of my investments elsewhere. The app is super convenient and well designed, and it motivates me to save more in the short term. I started with $25/wk, but even if you start out with only $5/wk, as long as you keep it up and actively look for ways to save and invest more over time, in less than a year, you will have well over $100. In my opinion they encourage people to start small, but not to stay there. Maybe there are better options out there for someone on a low budget and no investment experience, but if the options you are considering are Stash or Nothing, I definitely recommend it as a starting point. Hello everyone, I have a question for the group. I have had my Stash account since January of this year and I am up almost 700$. I have been trying to sell one of my stocks. The account says the stock is worth 1100.00 but I can only sell 1025.00. I am trying to close that stock and do not want it anymore. Why can’t I get all my worth. If they take that much on each of my stock I am loosing some much money. And trying to get an answer is ridiculous. Why can’t I sell and get what my stock is worth. You do get to sell it all, but you can only sell your full shares initially. The remainder gets sold in a separate transaction and usually takes an extra 1-2 days to get credited to your balance. But you get all of the face value of your equity priced at the time of sale. Eg. if you had 5.5 shares at $50 per; total value of $275, and you sell it all-You would get $250 upon sale (5.0 x $50), then a day or two later you would get the last $25 being the value of your partial share. When I started Stash, they gave me $5. Then I did a quote for life insurance (didn’t actually sign up though) and they gave me $25. Then I invited 3 friends since I’ve had it and got $5 a piece totalling $15. The way I look at it is, the $45 I’ve already gotten for doing virtually nothing has paid for almost 4 full years of using the service…PLUS they threw in the first 3 months free….before I put any of my own money in. I’m not sure if objectively this is the best way to look at it…but from a personal standpoint, I’m extremely happy. So far, I’ve learned a lot about investing via this app; I only have about $250 of my own money in there of which I bought in to Apple, Amazon and then also American innovators. As it stands right now while I’m typing this, I’m at about a 4.5% return which means that the $295 total has earned me about $13 so far. There is a Wrap Fee Program Brochure that states all of the terms of conditions that should be downloaded by the investor that answers all questions asked. Updated March 31, 2018. It provides the company address, email address and telephone number. It is a good idea to read the brochure first on any product or services of interest. I really love Stash. I have been investing for a couple of years, and though the fee is a dollar a month, I have more than made that back in dividends. I have about 2000 dollars in the account which has just been from money I had extra that I wanted to save. I think Stash is way more transparent than acorns (which I also invest in). 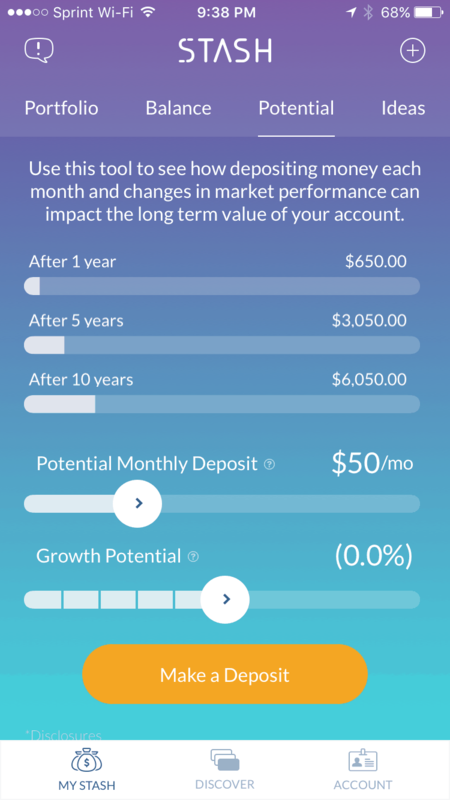 Acorns doesn’t say what your invested in (stock and ETF wise), but with Stash you see a breakdown of everything from performance to your total performance with the stock or ETF. I think I would be more concerned being invested in an app that charges nothing for what can they be doing with the money? Stash consistently has improved their services, and I have noticed that Robinhood and Acorns has taken a lot of the ideas from Stash. I invested 3000 3 days ago and have a total return of 6.62% on 1 ETF and 3.85% on a 2nd one. Did I have to go through Stash to invest….no….but I am not disappointed so far. The concern I have is that Stash doesn’t do dollar cost averaging. I have been putting money into Stash regularly for almost a year now and my account sometimes goes up but mostly down based on the current quote for the day even though I have been buying fractional shares for almost a year now even when the ETF was LOWER in price most of the time, The ETF I bought into around a year ago has been steadily going up. So the numbers don’t add up. Also when I emailed them about DCA (dollar cost averaging) and why wasn’t it reflected in my investing account they never got back with me, hmmmm. Dollar cost averaging isn’t something Stash does, but it’s what you do by investing at regular intervals. DCA simply means instead of investing $1,200 once a year, you invest $100/mo for twelve months. I really like Stash and use it in conjunction with my TD Ameritrade brokerage account. Stash is really good for when I want to purchase common shares of a company (i.e. Coca-Cola, GM, etc.) at bi-weekly intervals. I’d rather pay $1/month to purchase partial shares of many companies at a time (of my choosing) instead of $6.95/trade at TD Ameritrade. If TD Ameritrade and E-trade didn’t charge so much for trades, then I’d be using my brokerage accounts with them. The real downside I see with Stash, and think is a complete ripoff, is their Roth IRA: Stash retire. Most people can invest in a Roth IRA directly from their employer’s retirement investment servicer (Vanguard, T Rowe Price, etc.) for free. I like how start ups like Stash are offering services for people who don’t have $10,000 to open a brokerage with the big guys. For buying individual shares of stock, you should consider Robinhood. Commission free investing. On the flip side, if you’re going for index funds, look at TD’s commission free list. They have some awesome funds on there that don’t cost any commissions to invest in. Good luck if you want to close your account with them. I closed/cancelled mine a year ago and today they took out another unauthorized fee from my checking account. Next step…a letter to the NEW YORK STATE’S ATTORNEY GENERAL telling him about the fraudulent practices. I have done this in the past with other businesses, and you do get results. Also, contact the New York Dept. of Consumer Affairs. Robert, thank you for starting this post. This is very informative. Not just your post but I’m learning from other in this blog also. I’m new to investing. Only have a little money saved from last employer. Self employed as of now and nearing retirement age. So started personal invest to build or add to that for extra income for retirement. I’m nearing the $5000 threshold with stash. I am super busy and don’t have time to manage my (small) investment. Fees for stash is high but it’s so convenient. Does either of the other investment accounts does the deductions and invest automatically for you like stash? Congrats on building “your Stash”. Anyway, you might consider a robo-advisor that gives you better guidance (in our opinion) for the same cost. Check this out: Betterment Review. As you approach retirement, you might also benefit from using their CFP services to discuss how you’re doing.